Computer ports are an essential feature of all computing devices. Computer ports provide the input and output interfaces the device needs to communicate with peripherals and computer networks. The most important ports on computers are used for computer networking. Ethernet ports: Square-shaped connection points for Ethernet cables. 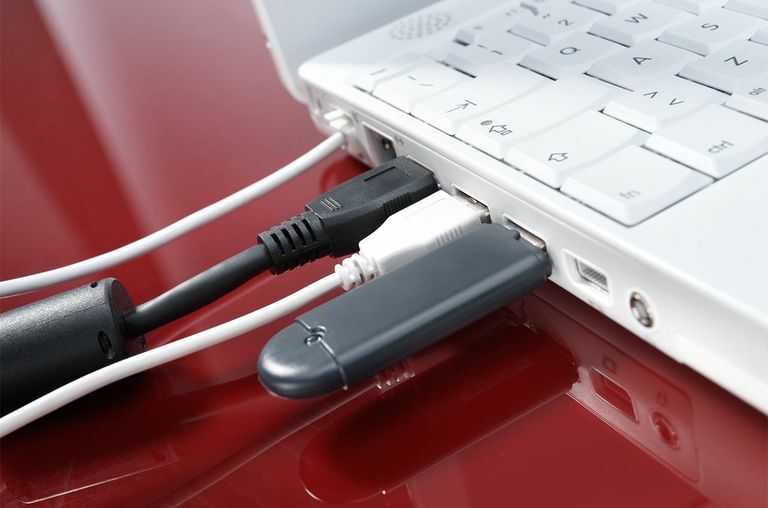 USB ports: Rectangular-shaped connection points for USB cables. Serial ports: Round-shaped connection points for serial cables. Whereas wired computer networks rely on physical ports and cables, wireless networks do not need them. Wi-Fi networks, for example, utilize channel numbers representing radio signaling bands. Virtual ports are an essential component of Internet Protocol (IP) networking. These ports allow software applications to share hardware resources without interfering with each other. Computers and routers automatically manage network traffic traveling via their virtual ports. Network firewalls additionally provide some control over the flow of traffic on each virtual port for security purposes. In IP networking, these virtual ports are numbered 0 through 65535. For more, see our article on what exactly a port number is. Power surges (for devices physically connected to electric mains). Damage caused by pins from cables (caused by inserting cables too forcefully, or by attempting to plug the wrong type of cable into a port). Except for damage to pins, a physical inspection of the port hardware will not find anything obviously wrong. A failure of one port on a multiport device (such as a network router) does not affect the functioning of the other ports. The speed and specification level of a physical port can also not be determined just by physical inspection. Some Ethernet devices, for example, operate at a maximum of 100 Mbps, while others support Gigabit Ethernet, but the physical connector is the same in both cases. Similarly, some USB connectors support version 3.0 while others only support 2.x or sometimes even 1.x. The most common challenge a person faces with virtual ports is network security. Internet attackers regularly probe the ports of websites, routers, and any other network gateways. A network firewall greatly helps to guard against these attacks by limiting access to ports based on their number. To be most effective, a firewall tends to be overprotective and will sometimes block traffic that a person wanted to allow. Methods for configuring the rules that firewalls use to process traffic such as port forwarding rules can be very difficult for nonprofessionals to manage. How Many Operating Systems Do You Use in an Average Day?